Fire safety was a key priority when it came to the specification of bespoke door sets a new multi-million pound leisure and retail development in south London. 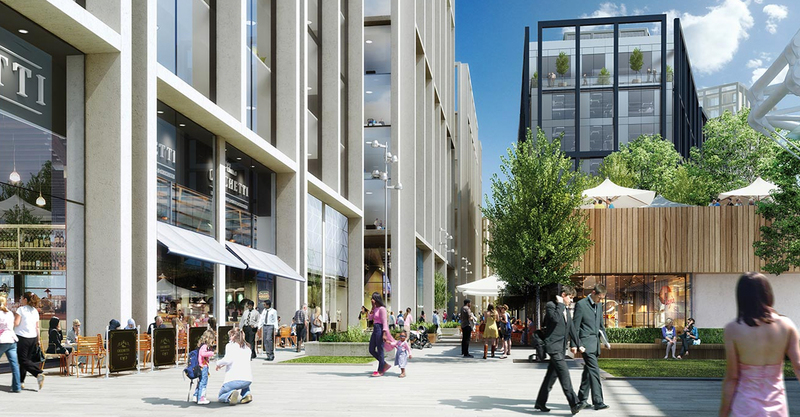 Ruskin Square, situated on a nine acre site adjacent to East Croydon railway station, will provide 1.25 million sq ft of office space as well as 625 new homes and 100,000 sq ft for retail and food outlets. Arkoni was tasked with the design, manufacture and installation of 18 door sets in total with steel feature surrounds and a fire integrity of one hour. Rory Swallow of Arkoni took up the story: “ We manufactured and supplied nine single and nine double fire rated door sets fabricated from Voest Alpine Form 50 sections. “The huge door leaves were over 2.8 metres high and fully glazed in one single pane of glass per leaf. I chose 13mm Pyroguard single glazed fire rated glass to fulfil the fire test requirement for such a large door leaf. It’s a product that would not impact on the movement of the doors. The door sets had a steel feature surround around the door frames, fabricated from 6mm thick steel sheets to form a concealed fixing when installed into the pre-cast concrete structure. Door closers were colour matched with the polyester powder coated framework. The work was carried out over nine floors of a newly built office block in an area of Croydon that is being extensively regenerated,” added Rory.